Kanyakumari (Kanniyakumari in Tamil language) is the Southernmost tip of India's mainland / peninsular India. 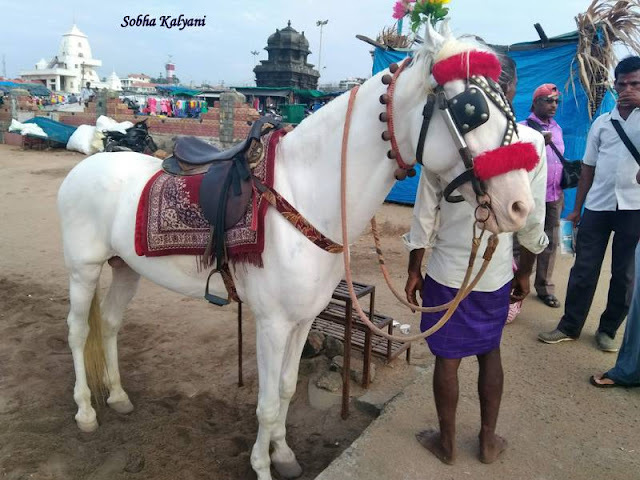 It is a coastal town in Tamil Nadu where the three seas (viz the Bay of Bengal in the east, Indian Ocean in the South and Arabian Sea in the west) meet. The city got the name after Goddess Kanyakumari - a form of Goddess Parvati Devi. The temple of Goddess Kanyakumari stands on the Southernmost tip on the sea shore. The compound wall of the temple can be seen in the below picture which is taken from Vivekananda Rock. In the picture below that is the Southernmost tip of India's mainland as seen from Vivekananda Rock Memorial. Sunrise from the Bay of Bengal in the east and sunset in the Arabian Sea in the west is the main attraction of Kanyakumari. Watching sunrise from the sea at Kanyakumari is a real treat to the eyes. Early in the morning tourists walk to the sunrise point. Below picture is taken early in the morning while walking to the sunrise point. 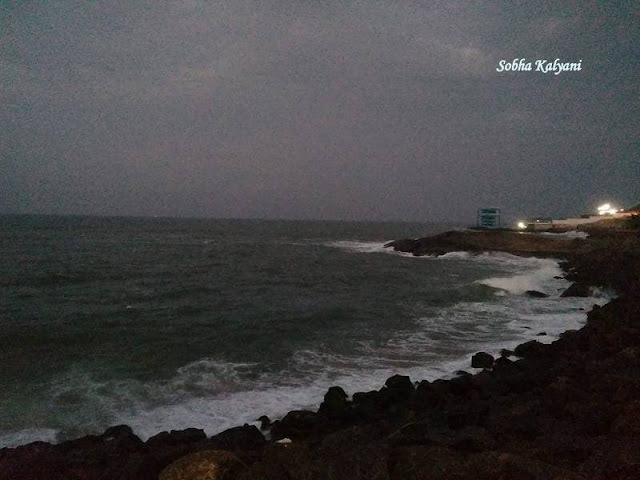 From the sunrise point Thiruvalluvar Statue and Vivekananda Rock Memorial can be seen standing amidst the ocean / seas. Below picture taken just before sunrise when the sky slowly turned reddish orange indicating the rise of sun. The place i.e. the Sunrise View Point is not heavily crowded with tourists but good number of tourists do gather at this place to watch sunrise.Watching sunrise on a clear sunny day would be really fantastic. As the sun slowly rises up and up and further up, the crowd of tourists gradually disperse. Some of them take a dip at the meeting point of the three seas (Trisea Sangam) which is close to Sunrise View Point. Some sit or stroll in the beach watching the mighty ocean and the waves dashing the rocks. It gives a kind of peacefulness and calmness to the mind. At Trisea Sangam, some local fishermen community people are seen searching for gem stones in the shallow sea waters. 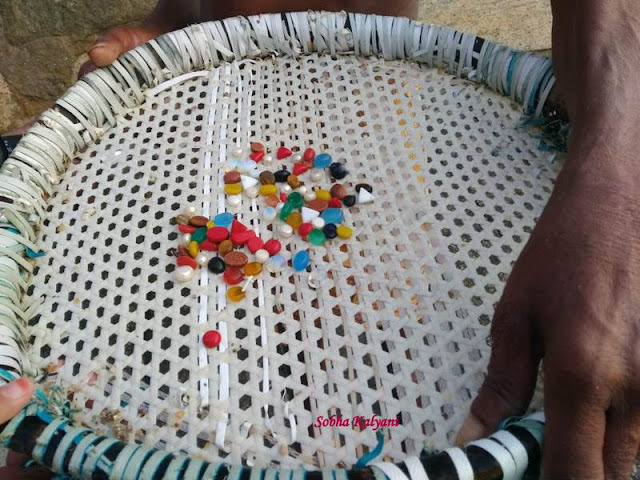 They pick the gem stones from the sea and sell these to the tourists at Rs.30 or so per gem stone. The genuineness of these stones is doubtful but as a memory some tourists do purchase these stones in view of helping the local vendors in earning their daily bread. 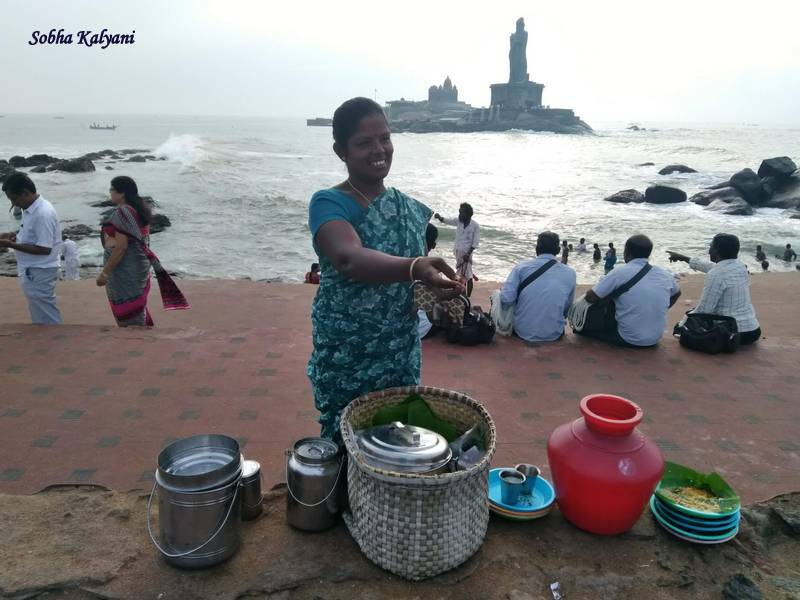 Some tourists are seen relishing hot home-made idlis and vadas sold by the local vendors at the beach. 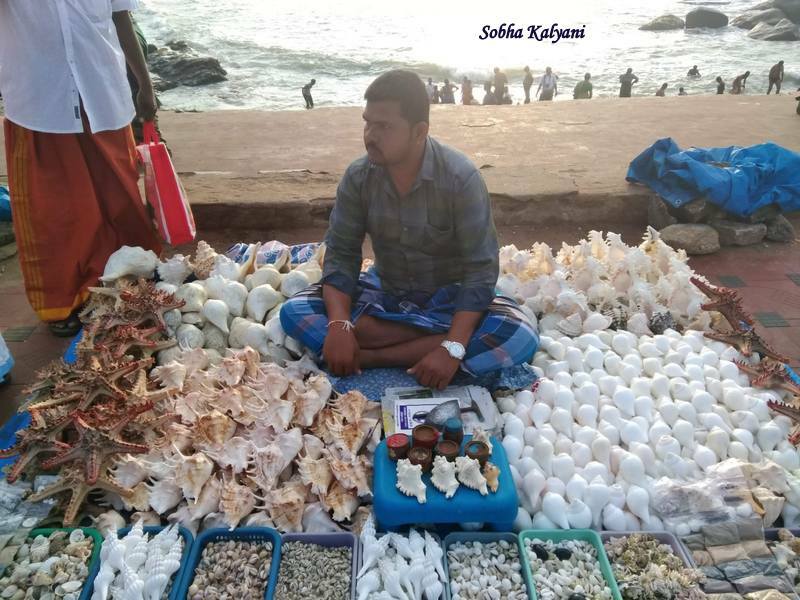 Many local vendors are seen sitting in the beach selling marine items like dried star fish, shells, conchs, different colors of sand collected from different beaches in Kanyakumari. 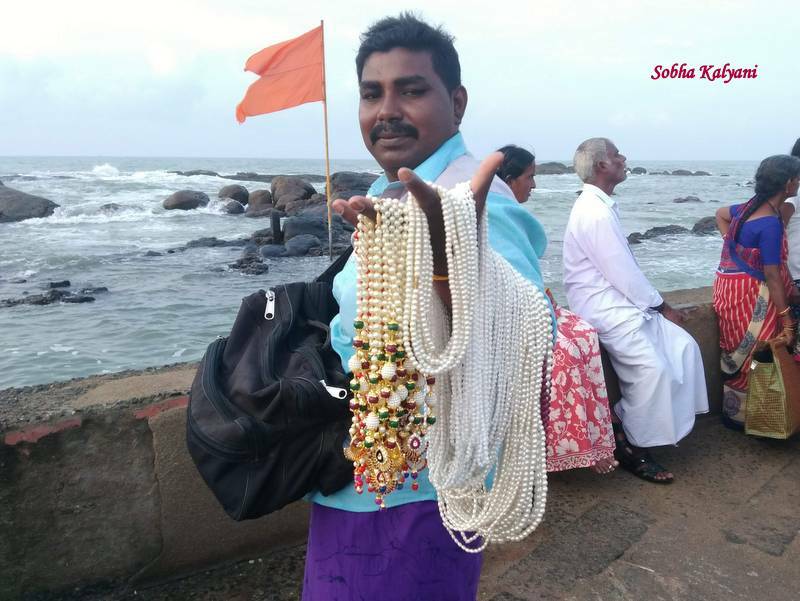 And some local vendors sell beautiful chains and necklaces made of pearls and corals. However the genuineness of these is doubtful. And a couple of healthy horses in the beach for children. The man charges Rs.50/- for one small round in the beach. It's a bit costly affair. Many tourists are seen hanging around in the beach in the morning after watching sunrise. 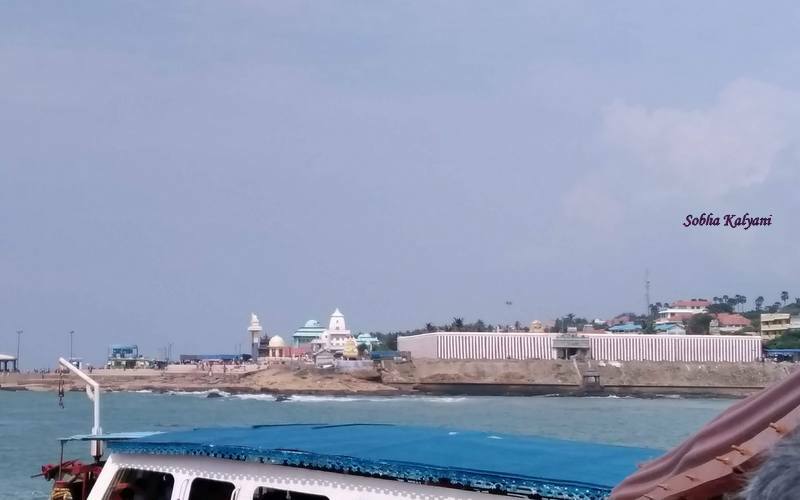 After sometime, the most of the tourists go to the ticket counter close to Goddess Kanyakumari temple, for purchasing ferry tickets to go to Vivekananda Rock Memorial. The ferry operation starts at 8 in the morning and there are frequent to and fro trips. It's Rs.50/- per person. Kanyakumari beach is one of the best and serene beaches which is not so heavily crowded. There are no water sports but only spirituality all around in the air. An excellent recharging to the otherwise stressed / tensed mind. A morning spent at Kanyakumari beach watching the spectacular sunrise at Sunrise View Point, having a dip at Trisea Sangam and then going to Vivekananda Rock Memorial in the govt owned ferry would be a memorable one for the tourists. When the weather turns cloudy / foggy with a layer of fog at the horizon, tourists feel disappointing as sunrise cannot be viewed properly.